For the recruitment of Jr Officer - Marketing and Operations in Grade B (Clerical Cadre) posts in Saraswat Bank, Saraswat Bank Admit Card is now released. Applied candidates can now participate in written exam on 15-07-2018 for which they can download Saraswat Bank Junior Officer Admit Card and attend the exam. 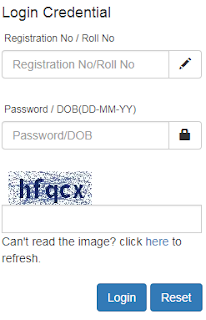 To download Saraswat Bank Hall Ticket applicants need to have login details like registartion no. and password. To get selected for 300 Saraswat Bank Vacancies aspirants need to get qualified in Saraswat Bank Recruitment Exam. Contenders can download Saraswat Bank Jr Officer Admit Card through online mode or follow the below presented steps to get Saraswat Bank Junior Officer Hall Ticket easily. Provided steps are prepared for the easiness of readers. Team members of www.privatejobshub.in has well equipped this page with pin pointed details of Saraswat Bank Admit Card 2018 aspirants can go through provided information and get Saraswat Bank Exam Admit Card easily. On the homepage you need to hit on “Careers” link presented at the top of the page. Thereafter choose ‘Requirement for Junior Officers - Marketing and Operations’ link that is available in left side under “Career” section. Further on appeared page, press “Link for downloading Call Letter” link. By pressing said link, a new page will appear where image like mentioned below will appear. Enter the required details such as Registration No. and Password in the space provided. Once all details are filled hit on “Login” Tab to get Saraswat Bank Admit Card 2018. After then, your Saraswat Bank Call Letter will appear on the screen. Now, you need to download Saraswat Bank Hall Ticket and take a printout of Saraswat Bank Junior Officer Admit Card and bring it at the time of examination. The candidates will be selected as per below-given recruitment process among the eligible candidates. The merit list of shortlisted candidates for interview will be displayed on Bank website. Minimum 50% marks on total will be required in Online Examination. Candidates may download the Saraswat Bank Admit Card 2018 from the given Official Link. You can also follow us on Facebook and Google plus to get updates on your timeline. You can give your queries and suggestions in the comment box. Dear aspirants! If you want to acquire latest updates about result, admit card, notifications etc you must visit our web portal www.privatejobshub.in time to time, you may also subscribe us to get free email alerts.